By default, VWO anonymizes all key presses to avoid storing or transmitting any personal or sensitive data to VWO servers. Under Recordings > Settings > Configuration, the Anonymize all key presses option is checked by default. 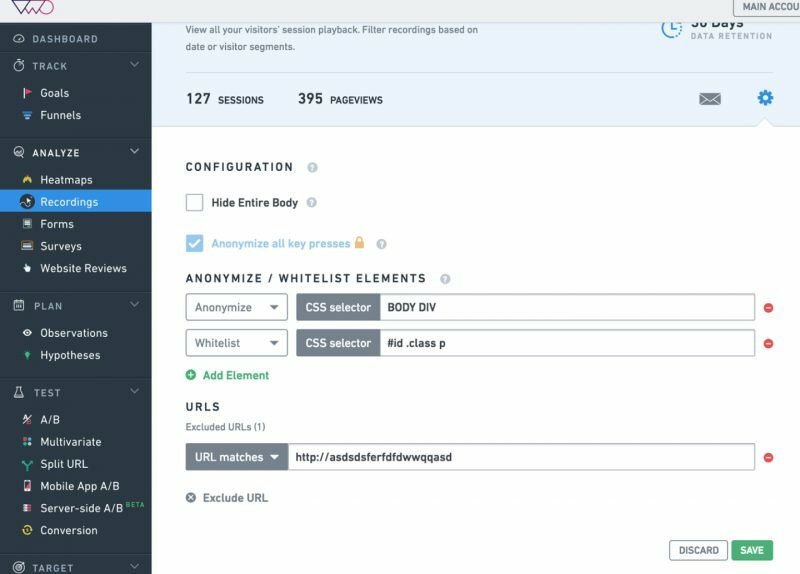 Add the selector path: To anonymize an element on using the selector path, select Recordings on the VWO dashboard, click Settings and then select Configuration. In the Configurations section, go to Anonymize/Whitelist Elements and enter the CSS selector path for the element. ATTENTION By default, all password fields and three consecutive digits of any number will be anonymized. However, password field will always be anonymized, regardless of whitelisting such fields. For numerical inputs like credit card, social security number, or CVV, enabling anonymization will replace the actual input with zeroes.